It's semi-finals week, and I am more than usually excited!!! I had the great fun of attending a sewing class this weekend, and we spent ages chatting about the Great British Sewing Bee. The consensus was that it was a terrific show, and was inspiring sewers to get their machines out and start sewing. There's some negative press out there (why does the Daily Mail have to keep publishing those negative, snarky articles by Jim Shelly? ), but on the whole there's lots of genuine excitement for the show. It really was great to talk to other people who are enjoying the show as much as I am. Before I get started on this week's episode, I thought you might be interested to know where you can learn more about the four remaining contestants. Drape a dress using 3m of fabric, pins and a dressmaking form (techniques must include cutting, draping, pleating, shaping and gathering) in 3 hours. Surprisingly this week's pattern challenge didn't involve a pattern at all. Contestants were asked to select 3m of fabric and making a dress with draping and pleating, using a dressmaking form. There was only one fabric choice this week that I didn't like, and that was Heather's. It was a satiny, floral print in a really drab colour. Chinelo chose a lovely orange large print floral, Tamara chose a red and white floral, and Heather chose my favourite fabric with a cream and black wavy print. Probably the most difficult part of this challenge is that none of the contestants seem to have done much, or any, draping using a dressmaking form. Chinelo was obviously the most confident, given that she doesn't generally work from patterns, but she seemed less sure of herself than usual. Lynda draped a strapless maxi dress with a high waist, and a big floppy "bow" detail. Heather made a sleeveless, cowl neckline dress with a pleated, knee-length skirt. Tamara made a sleeveless knee-length dress using pleating and tucking. Chinelo made a strapless maxi dress with an empire-line waist and a drapey, "tulip" skirt. Chinelo - Patrick wasn't sure that the skirt worked as it wasn't a proper tulip shape. May really liked it. The judges noted that it wasn't completely symmetrical, and almost worked. They commented that it wasn't evenly sewn and was a bit "lumpy bumpy". Tamara - tucks wer used for shaping at waist and under the arms going in different directions. May felt they were sometimes fighting with each other. Patrick felt it was a little too over tucked, and that a dart would have cleaned it up and given the draped sections more impact. Heather - using a bias cut on the bodice meant the front is sitting well. May loved the draped neckline and felt it worked well. The judges liked the nice even pleats, which gave the back a good shape, but there was a giant pleat on one side (which Heather made to take in extra fabric) which had got caught inside. Lynda - The skirt looked balanced and flowed well, the bodice fit really well and was well executed. Patrick thought it was a dry good demonstration of how you can build something on the mannequin. The results from 4th place are Tamara, Chinelo, Heather in second, and Lynda in first. Take a sleeveless dress and add sleeves in 1 3/4 hours. 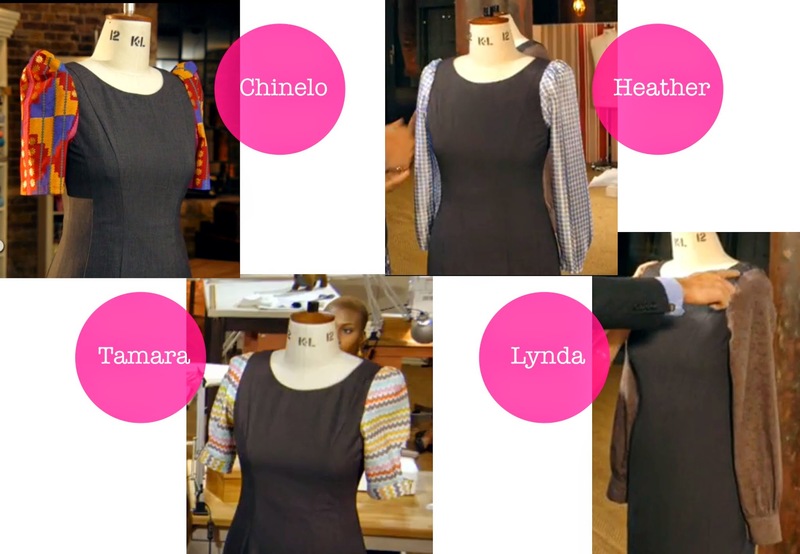 Contestants were given a basic fitted, grey, sleeveless dress and asked to add sleeves. They could use any fabric or trim from the haberdashery. The judges were going to be looking for symmetry and a good finish. May pointed out that contestants need to make sure they measure the depth of the armscye, the circumference of the armscye and the circumference of the arm in order to get perfectly fitting sleeves. 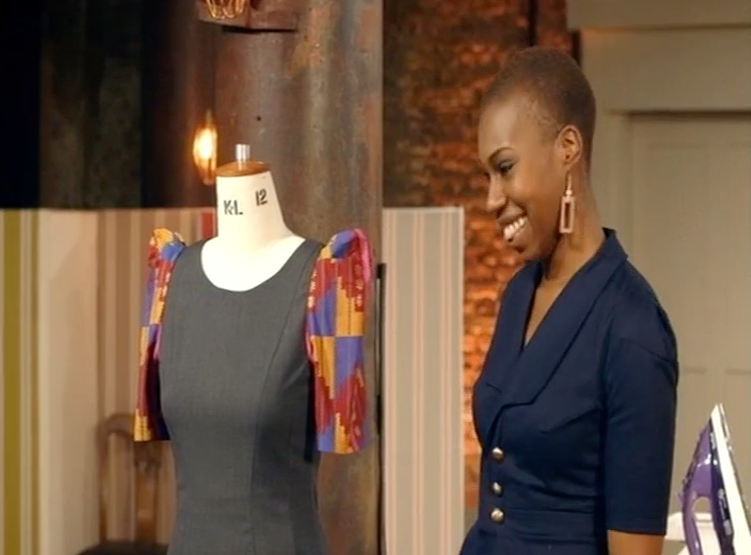 She thought that this was the most difficult alteration challenge they had been given, because they need to draft a pattern from scratch, and the judges wanted precision. Chinelo added short sleeves with a tucked detail on the top in a bright geometric print. Tamara added short sleeves with a gathered top, button cuff and large cutout feature above the cuff button in a scalloped stripe, pastel print. She knew what a sleeve pattern should look like, but had never drafted one before. Heather added long sleeves with a gathered top in a blue, spotty fabric. Lynda added long, fitted sleeves with a buttoned cuff in a drab mauve fabric. She had also never drafted a sleeve before. Lynda alarmed Claudia but admitting that she had measured-ish and drafted-ish her sleeve. Chinelo - Patrick thought it was a different choice of fabric, but he liked it. The judges noticed the pink stripe that was perfectly centred, and ran vertically down the sleeve, both sleeves were identical, and the seams were smooth. Tamara - The shoulder pleats were evenly done, there was nice topstitching on the cuffs and cutout opening, but the sleeves were not vertical, and pitched slightly forwards. Heather - Patrick's eagle eye noted that the sleeve lengths appeared uneven and whipped out a tape measure - 1/4" longer on one sleeve! The judges noted that the pattern of dots on the sleeves ran perfectly vertical, the shoulder lines were very smooth, and there was no distortion. Lynda - One sleeve was lovely, and one was pulling out of shape. One cuff was neatly done and one was uneven. Patrick noted that the button holes had been sewn across the cuff, instead of around. The results from 4th place are Lynda, Tamara, Heather in second and Chinelo in first. Copy a favourite item of clothing in 6.5 hours. Contestants were asked to bring in a favourite item of clothing, and to recreate it. Contestants were not allowed to bring in patterns. They either had to draft a pattern on paper, or take a pattern from the original garment (using a method like rubbing off). May felt that this challenge would demonstrate a useful set of skills. Lots of people have a garment in their wardrobe they love, and would want to recreate. Patrick thought this was a substantially difficult challenge. It's not just tracing an outline of a garment. There needs to be an understanding of how the geometry of the garment construction works. Chinelo copied a boned, strapless party dress which had a semi-circular skirt decorated with rows of ruffled chiffon - 42 rows! The recreated skirt was made from strips of flat organza with an ombre effect from cream to black. Patrick thought she was absolutely crazy to make a skirt with so much work involved. Chinelo drafted her pattern by measuring the original dress, and drafting a paper pattern. Tamara copied her favourite yoga outfit which featured a top made from 22 panels. She tracked her pattern onto micro fibre cloth by feeling for the seams and drawing around the shapes. Tamara had chosen a range of fabrics for her top, and had to be very careful to manage the different stretches. 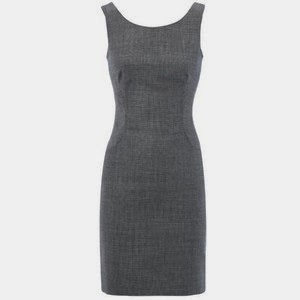 Heather copied a simple fitted, sleeveless shift dress. She made her pattern by sewing darts into a draft fabric first, then laying it on the original dress to trace the outline. Once this was done, she unpicked the darts to reveal her pattern. Heather was worried that her dress was much too simple, compared to the other contestants, and wanted to make sure she achieve a perfect finish. Lynda copied her favourite knit wrap dress. She took measurements and drew a rough plan on paper. She then began tracing her dress onto the new fabric with chalk. Lynda was halfway through cutting when she realised she had not bought enough fabric. Patrick and May allowed Lynda into the haberdashery to pick a new fabric. Unfortunately there didn't seem to be a huge selection of knit fabric available, and the fabric Lynda chose was softer and more mobile than her original fabric. Chinelo - the top is nicely balanced and fits well, some of the sewing is a little uneven, the layers on the skirt are attached evenly, and the ombre grading in the skirt works really well. May preferred the copy to the original garment, and Patrick thought Chinelo had updated the dress and made it more refined. I couldn't help noticing the threads hanging off every row of chiffon. Perhaps if the strips had been bias cut, or cut from a non-fraying fabric, the finish would have been neater. 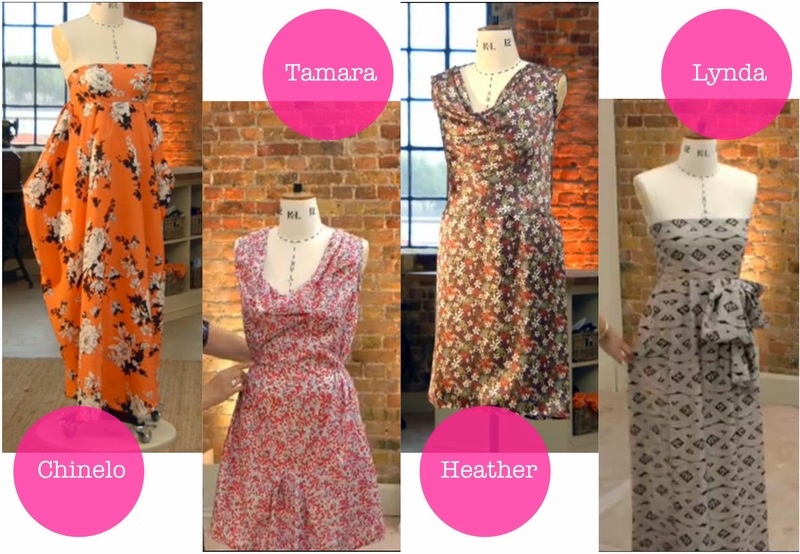 Tamara - the garment works incredibly well and fits perfectly. Tamara made a multi-panelled, multi-fabric garment and everything is sitting where it should. May liked the 3-step zig zag top stitching. I thought the copied garments looked much stiffer than the original yoga clothes. Heather - the fit is a bit disappointing. It's tight around the hips and wrinkling across the back. May suggested Heather may have taken the hips in too much, or made it too long in the back bodice. Patrick noted that one shoulder is a fraction off, and is sitting up. Overall it was an extremely accurate copy. Lynda - May commented on the nightmare of a day for Lynda. While the skirt pleats are even and well spaced, the waistline is "going for a bit of a walk". The pattern was matched well on the seams, but it was tipping forwards. Heather - they are not mad about her copied dress. It didn't fit at all well, and was the simplest garment. Lynda - she has been terribly inconsistent. She won the first challenge and the judges thought her dress was excellent, but she made a big mistake in the construction of her copied dress. Tamara - she didn't do well on the first two challenges, but her yoga outfit was brilliant. Garment of the week went to … Tamara for her yoga outfit. I'm so sad to see Lynda leaving. She was definitely the most inconsistent of the remaining contestants, and frequently went from top to bottom throughout an episode. I think if Tamara hadn't made such a complicated and successful yoga outfit, it would very likely have been her leaving this week. We were given a very vague sneak peek of next week, that involved yards of tulle, dresses that looked suspiciously wedding themed (perhaps flower girl and bridesmaids), and Chinelo wishing it was over and having a teary moment. As much as I'm looking forwards to the grand final, I don't want the show to be over. The Thrifty Stitcher - Claire-Louise Hardie is the Sewing Producer for The Great British Sewing Bee, and usually does posts about the patterns used in the first challenge on each episode, and also has some nice posts about techniques used. She has posted some tips and links for draping and copying existing clothes this week. Thanks for posting a detailed recap and the links. I'm in Australia and at the mercy of finding eps on YouTube. It's easy to find out who leaves each week but I miss the sewing details and this was great. I do feel the 'ghosts' of May and Patrick over my shoulder when I sew and wrote a mock judgement of one of my disasters! Glad you enjoyed the recap. I too find myself taking more care when I'm sewing, so I can produce a beautifully finished garment. I used to be really haphazard, and I'm trying to unlearn some really lazy habits. Linda was the most consistent! She won more firsts/best in show than anyone else. She had the best across the board skills of anyone. The week earlier they said she was the most consistent competitor as well. Weird. Heather or Tamara should have gone. Probably Heather, who is not that interesting although has nice finishing skills at times.